This postcard view pictures the west side of the intersection of Patrick (now known as 20th Street) and Main Street. The T. M. Lake store is at left and the old City Hall building is at the right. 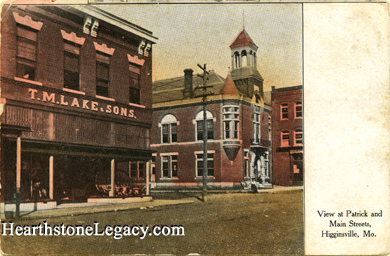 The T. M. Lake building is still standing (2008) and still looks very much as it does in this postcard view. The T. M. Lake name on the building is still faintly visible. No publisher information is stated on the postcard. The postcard was not postmarked but dates from the early 1900's.